Pedialyte or Gatorade For Dogs? Can I Give My Dog Pedialyte or Gatorade? Do dogs suffer from dehydration? Definitely. It may be hard to notice your dog’s dehydration since he is always wearing a smile when he is panting. However, he may be internally thirst, and one way to ensure this does not happen is by providing him with Pedialyte or Gatorade for dogs. But, aren’t Pedialyte and Gatorade meant for humans? Well yes, however, you also need to acknowledge that your dog can suffer from dehydration as well. This is likely to happen on hot days, after playing or exercising, after contracting a worm or virus (Parvo Virus), or when he does his business. Bullyade is designed to as a treat, mulit-vitamin, and recovery supplement for all dogs. How do you know your dog is dehydrated? Easy, just carry out a skin pinch test. Pinch your dog’s skin and watch how it reacts. If it bounces back immediately, your pooch has all the water he needs. If the skin takes a while to regain its elasticity, your pet friend could be in danger. If your dog is dehydrated, he will start to pant a lot and appear lethargic. His mouth will be dry and his eyes may appear sunken. His energy and enthusiasm may plummet as well. What is happening is that his body is trying to compensate for lost water. By doing so, the body will draw water from the cells to try and keep the whole body hydrated. In the process, your pooch is also losing important electrolytes that keep his body healthy. Is Pedialyte or Gatorade for dogs any Good? This is another absolute yes. 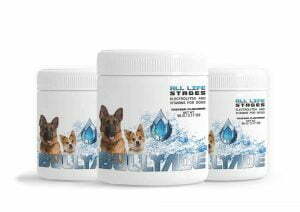 Besides upping the levels of electrolytes in your pets system, your pooch could also get vital minerals and vitamins from advanced rehydration solutions called Bullyade. Bullyade, a certified hydration solution designed specifically for dogs. Bullyade has over 18 unique water-soluble vitamins and minerals. This is a goldmine for your pooch in terms of keeping his body strong and healthy. 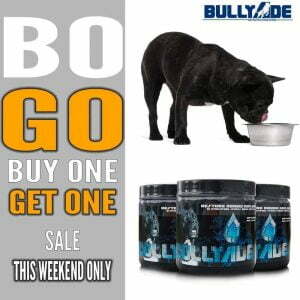 In addition, Bullyade has a natural meat flavor that your dog will relish with each sip of water he takes. In fact, he may forget his meals and just drink his water–and this should not alarm you at all. 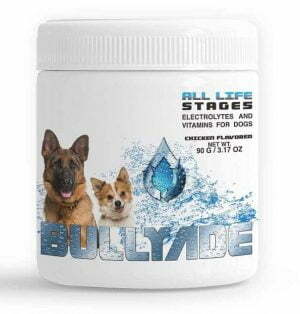 Bullyade is the pet version of Pedialyte and Gatorade. So, your pooch will rip the same benefits you do when drinking your mineral water. Only that he has over 18 vitamins in his own bottle so he may outwit you in the health department. Bullyade is a perfect solution if your pooch refuses to touch his food. Maybe he fell sick and lost his appetite (Parvo, coccidia, heat exhaustion, upset stomach) or he is trying to get accustomed to a new diet. Nevertheless, Bullyade packs enough minerals and vitamins to keep his organs running and his skin healthy. With enough water and minerals in his body, your dog will look and feel healthy. His skin and coat will always remain lustrous. He won’t fall sick as often and you will never have to worry whether he is properly hydrated or has enough nutrients in his blood. So, Pedialyte and Gatorade are perfect hydration solutions for your pooch but may not do enough when it comes to saving your pets life and increasing their overall health. You can give him his own version of Pedialyte/Gatorade through pet hydration solutions like Bullyade. Bullyade not only keeps your dog well-hydrated, it also contains 18 unique vitamins and minerals that help keep your pooch alive.